Though I have spent some seven years documenting the former Pennsylvania Railroad I can count on one hand how many times I have actually rode the original Main Line between Harrisburg and Pittsburgh. This past weekend I graduated to three fingers making the round trip to Pittsburgh from Philadelphia. This one however was no ordinary trip; in fact it was quite special, for it was made on two privately owned historic rail cars; Bennett and Eric Levin’s lovingly restored Warrior Ridge and the Pennsylvania 120 a former PRR business car. As an invited guest myself and several others were lucky enough to see the landscape that that PRR has traveled since its completion in 1852, traveling through places I was all to familiar with but not always from the perspective of the passenger. "Storm lifting in the Packsaddle", William H. Rau photograph. The Packsaddle is one of several locations that were used during various illustration and photographic campaigns on the Pennsylvania Railroad in the 19th Century. Collection of American Premier Underwriters, Inc. It got me thinking as several of us discussed various facets of the PRR including illustrative and photographic campaigns undertaken over the years by the company. 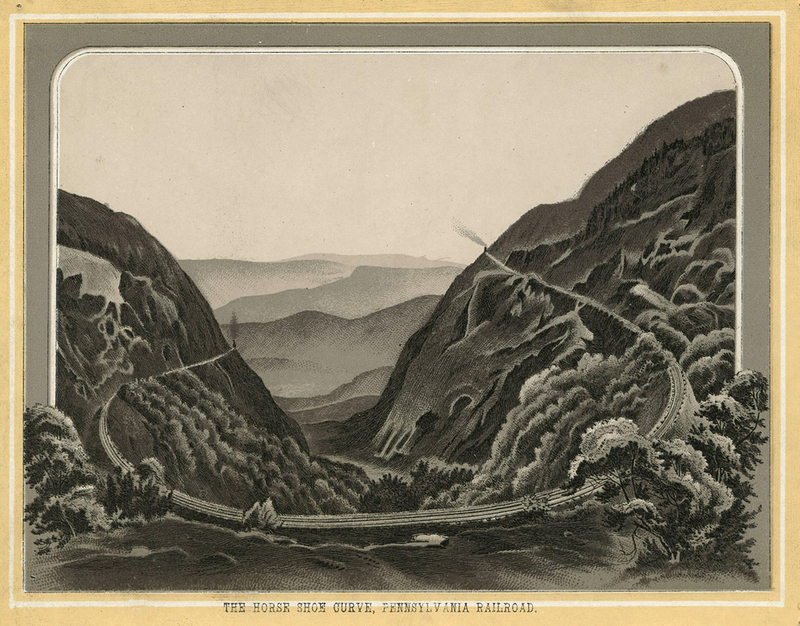 These campaigns were geared around flaunting the scenic vistas along this prolific engineered corridor; some are revisited several times, in particular during the second half of the 19th Century. Riding in a car that served PRR President Walter Franklin among other officials, I could imagine the conversations and acknowledgment of these beautiful locations that seemed to captivate railroad men whether it was because they conquered a particularly difficult pass there or because the beauty was just that breathtaking. 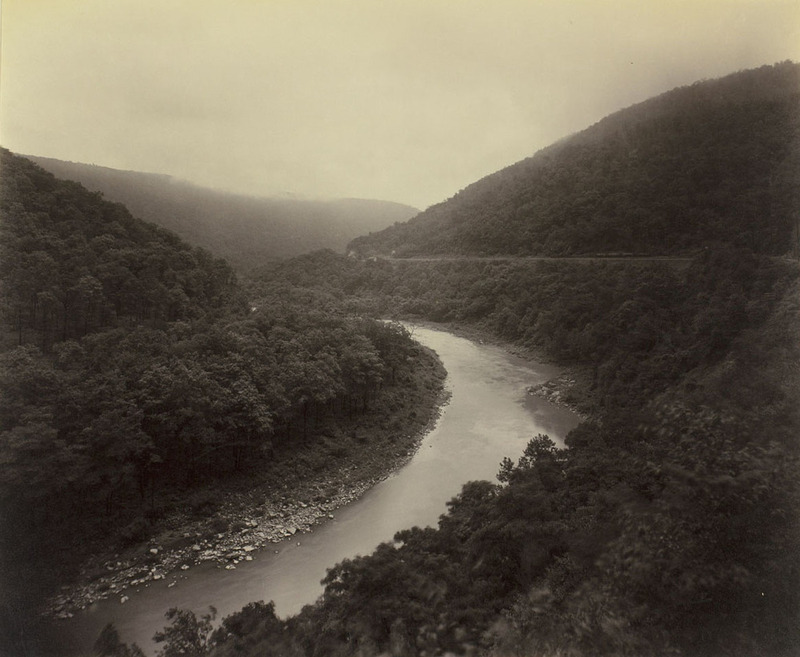 For over 160 years the PRR has traversed this natural landscape following the majestic Susquehanna, Juniata, Conemaugh and Allegheny Rivers among others. Throughout that time countless passengers gazed out the window at areas commanding names like Warrior Ridge, The Packsaddle, Mineral Point and Jacks Narrows. Let us not forget how many experience the westbound ascent of Horseshoe curve out of Altoona, entering the famous engineering landmark high above Burgoon Run one quickly gets a sense of the curve's purpose, watching an eastbound descend the mountain across the valley at a noticeably higher elevation. Places like this were engineered by brilliant and driven men on the backs of cheap labor wielding pick axes and shovels, they are a testament of what was possible in the by gone era of industrialization. But yet they still survive, moving countless trains on a given day, a refined version of J. Edgar Thomson’s engineering genius. Besides the trains themselves little has changed from when Frederick Gutekunst or William Rau left footprints in the cinders making the large format images that preserved this rugged beauty. I have always been fascinated by the undefined spaces the railroad travels, the areas in-between the towns, cities and villages that create a sort of rhythm that illustrates the growth and progress the railroads fostered along the line, watching the ever changing landscape from the window of train who’s predecessors we owe our Nation’s existence to. "The Horse Shoe Curve, Pennsylvania Railroad" Illustration of the engineering landmark envisioned by J. Edgar Thomson from an 1895 travel book which illustrates the scenic highlights of the Pennsylvania Railroad Main Line. Collection of the author. Yes this weekend was a welcome distraction, a reminder of why I embarked on this project, to document and share a railroad so historic and massive that its reputation and design lasted longer the company itself. To spend time on the railroad with like minded folks on a pair of beautifully restored private cars was exactly what I needed to put into perspective the past, present and future of railroading on the Pennsylvania Railroad and the landscape it travels. In regard to preservation, I take off my hat to people like the Levin’s who share the legacy of railroad travel in style and take every opportunity to see to it their guests are comfortable and having a good time. And to my fellow travel mates, I made some new friends and shared some great stories about the very railroad that bought us all together. Though the Pennsylvania Railroad has been gone for quite some time it is experiences like this that reinforce that the spirit and pride of the former Standard Railroad of the World is still very much alive through so many people and their work to preserve our railroad heritage. This is a trip that will stick with me for quite a long time!